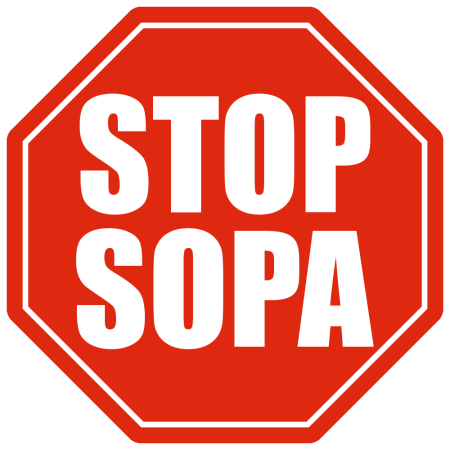 If SOPA should pass, I will be forced to take down this blog and indeed, the entire website. It will also mean free speech will have officially died in the United States, and the golden age of the internet will be over. I wish this was just over-sensationalist doom-saying. I really do. However, these bills SOPA (Stop Online Piracy Act) and PIPA (Protect IP Act) are so overreaching and broad that none will be unaffected. It shifts the burden of proof to the accused, with no penalty for false claims. This means if any US government or corporate organization wants to censor someone on the internet, they can claim copyright on a portion of their media and get it all removed... Even if they don't actually own the copyright! The content will be taken down, and it will be the burden of the accused to go through the lengthy and expensive process of proving their innocence. It doesn't stop there, even external sites that were found to be linking to the "copyrighted" media can be issued court orders to shut down. This extends beyond US borders, too. Any foreign sites accused of infringing will be blocked by the newly formed Great Firewall of "New China" (America). Like it or not, many of the world's largest internet companies are based in the United States. All this to stop online "piracy" which is against the law anyway. We've already seen laws are not going to stop piracy.